As Christians, every single moment of our lives should be a testimony to the Glory of God. That is an overwhelming thought, isn’t it? The problem is, we are human, and will fall short. We must not lose heart, for those are the moments that Jesus uses in our lives to help us on our spiritual walk, for all things work toward good for those that love Him. When we love the Lord, open our hearts to the Holy Spirit, and strive to align ourselves with Him, He will work for us and through us in all circumstances. A beautiful moment of testimony was shown to my husband and me this morning. We stopped on our way to work for our morning coffee, and witnessed a Jesus love moment. An older man who was using a cane, and a little unsteady on his feet, slowly got out of his car and looked at the icy ground. As he was assessing the situation, a young, strong, somewhat scraggly looking construction worker bee-lined over to him, and very slowly and patiently helped him into the restaurant. That seemingly small act of kindness was a testimony of God’s love and glory. Have you witnessed any of these moments lately? When you do, treasure and ponder them in your heart, and don’t forget to share! We all need to hear of the good things that are happening around us daily, for Jesus is in our midst every single day. Praise to the Father, Son and Holy Spirit for all the opportunities we are given every day…no matter how small they may seem…to love as Jesus loves, and to glorify our Father in Heaven! Categories: Catholicism, Christianity, Somebody Loves Me | Tags: Bible, Construction Worker, Holy Spirit, jesus, Kindness, love, Testimony | Permalink. Do you like to read? I love reading…especially inspirational or spiritual books. Right now, I am in the process of reading “Saintly Solutions” by Fr. Joseph Esper. This book is very enlightening, because it offers solutions to life’s common problems – from anger, boredom, and temptation to gluttony, gossip and greed. The most interesting facet for me is that for each of life’s common problems, this book reveals a saint who experienced the same weakness or struggle. There are also suggestions for things you might try to overcome each issue. Today, as I was reading, one line especially caught my eye. As I journey on my spiritual path, I have found this to be true. Now that I am getting to know Jesus in a personal way, and have opened my heart to the Holy Spirit’s light, it is so easy to find pleasure all around me. My spirit has been set free! Simple things are beautiful to me, and touch my heart. Little things like waking up one more morning with my husband next to me, enjoying a beautiful sunrise or sunset, watching birds or squirrels in my backyard, listening to beautiful music, visiting with family or friends, praying and feeling the presence of God…these are some of the joys that fill my life. When things are difficult, I ask God to open my eyes to what I should be learning from the circumstance. No, my life is not perfect, and I have a lot of growing to do. However, I can honestly say I feel more love, pleasure and joy in my life than I ever did before. It is a feeling of inner contentment, and trust that God loves me and will always be there for me. He will carry me through. My prayer is that the Lord fills our hearts to overflow with his love and moves us to share that love and joy with those he places in our lives every day. Because that person he is entrusting to you is hurting and in need of Jesus’ saving grace. You were uniquely chosen for specific moments to touch specific people. What could bring more pleasure than serving our Lord and sharing him with a world in need…one heart at a time? Categories: Catholicism, Christianity, Somebody Loves Me | Tags: eternal life, god, Holy Spirit, pleasure, spiritual books, spiritual path | Permalink. It was time. The closet in our spare room was jam-packed. It got to the point where I could hardly access anything, due to the sheer amount of stuff in there. Ok, a lot of it belongs to my mother, who lives with us. But I must admit, as I started to empty the closet and sort things out, I found lots that I even forgot I had! While I was cleaning and organizing, I couldn’t help but go through everything. I really didn’t have anything else pressing to do, so I decided to slow down and enjoy the process. A few hours later, my heart was warm and full, and I had a lump in my throat. What I found were memories. Lots of them. There was a big bag filled with old slides from my growing up years. Those slides were digitized and posted a while ago…why is it so different to actually hold them in my hands? Probably because my dad was in charge of the slides and pictures, and he has been gone now for eleven years. I do miss him! How much fun it used to be for our family to watch the slides and the home movies together. Those were special times. The next thing I looked through was my husband’s old photo album. Why did I never before appreciate the pure genius of my mother in law, who insisted he put Vaseline on his lips, and wear a red shirt every year for his school pictures? And then arrange the photos next to each other so the progression can be seen? And oh my gosh, there is a picture of him when he was about 4 years old, and I clearly see the image of my youngest son. If the picture wasn’t in black and white, set in the sixties, I wouldn’t be able to tell the difference between the two of them. And why does seeing pictures of my husband as a child make me smile and tug at my heart? I found a framed copy of my oldest son’s green hand prints on white paper, dated from when he was 2 and a half years old. The glass is broken and I really want to reframe it and send it to him as a surprise. For some reason, I am not ready to part with it. He would not yet appreciate the innocence and tenderness of the child he was way back then. He always kept me on my toes, forever chasing after him to keep him out of danger. However, even as a young child, he had the hugest heart and was very intuitive to people’s needs. He is still like that. My youngest son is a graphic designer. Not only did I find his high school and college art portfolios, but I also found pictures he drew when he was really young, and some from middle school. Those pictures brought back memories of when he was in grade school and sold his black and white pencil drawings to his friends. We found out later that not only did he he accept money for his artwork, he even charged extra for color. He used to say “I AM an artist.” He was right! In the corner of the closet, I found a beautiful china tea set, given to me as a gift, that is inscribed with bible verses. I am holding onto it, because I look forward to sharing tea with a future granddaughter (or granddaughters). The last things I sorted through were all the wrapping papers, ribbons, and bows. I am known for saving bows, and we keep reusing them over and over. I have a lot of them! Some have pieces of birthday or Christmas wrap attached. I realized that I was looking at years of memories, with my sons, and their wives. All of us together, tearing through birthday or Christmas gifts. Laughing, hugging, and enjoying each other’s company. I was overcome with the knowledge and feeling, that without even realizing it, we were creating memories through all those years. Memories that we are blessed with, and that can never be taken away. Lord, thank you for the blessings of our family and friends, for all the memories we have in our hearts, and also the ones we have to look forward to. Help us to cherish the times we have together, and to always know that you are the source of those blessings. Categories: Catholicism, Christianity, Family, Gratefulness, Relationship | Tags: artist, Blessings, graphic designer, home movies, Memories, photo album | Permalink. Recently, I was reading a convert’s testimony, and one of her thoughts flew out at me. The idea is, that being human, we tend to compare ourselves and our lives to those that have more than us. This tendency, coupled with the intense marketing of Hollywood and our culture, many times leads us to covet what we don’t have. It’s such an “exciting” world out there, and we are missing out! We start to focus and want (the catch phrase for this desire is “dream”) all the things that we feel we are missing out on. Material possessions, status, beauty, glamor, lifestyle, education level, etc., start to dominate our thoughts. We may even begin to wonder why God hasn’t blessed us with these things. Why would He provide certain things for others, and not for us? When we allow our thoughts and heart to dwell on what we don’t have, we are stuck in the “me” position. As much as we don’t want to face the truth, that is a very selfish place to be. Instead of looking at all that WE don’t have, the better focus would be to open our eyes to the people around us that have much less than we do. Not to feel “better” about ourselves in comparison, but to learn to be content and grateful for the gifts God has blessed us with, and look for ways to help our brothers and sisters. In essence, we need to change our focus from looking toward ourselves, to looking outside of ourselves and seeing a world in need. Lord, thank you for all the grace and blessings you have bestowed on me through your loving Spirit. I ask that you open my eyes to the ways I can share your love and the blessings in my life, with all those who are in need. Please enlighten me to become more aware of those who are hurting and lonely, and open my heart so I know how to be of help to them. Reveal to me those who are hungry in order that I can share with them…not only food, but also love and friendship. Open my heart and fill it with compassion, for those who are traveling a dark path without You. Help me to be there in love for them, instead of judging them. Help me to always be grateful for the mercy you have bestowed on me, and empower me to always search for a way to love those you place in my life each day. For it is through that love, that they will see your face when they look at me. The Happy Prince This is a beautiful story of selfless giving. It has been my favorite since I was a child. There are parts I literally can’t read out loud because they touch my heart so deeply. Enjoy. Categories: Catholicism, Christianity, Gratefulness, Prayer, Somebody Loves Me | Tags: Blessings, compassion, Grace, love, The Happy Prince | Permalink. For a few years now, I have felt the call to lead a Tea and Fellowship Ministry for the women in our parish community. What I have seen is that although the church is always filled for every Mass (we have an extremely large church) and there is always a big turnout for events, I noticed that there aren’t many true friendships. Here is what I found. When I meet someone new through church, I always ask how many people they know from our parish. I am not talking casual friendship; I mean true friendship. The kind that warms your heart and feels like family when you walk into church or a parish event. The kind where you know you have support in your Christian walk, and there is always someone to call when in need. The kind where you, yourself, are always open and available to your sisters in Christ. The answer is usually the same. They may know one or two people; not many close friendships at all. When I was younger, and raising my boys, the women were the ones who developed the relationships in the communities. It was much simpler back then, because most of us were stay at home moms, and relationships seemed to develop themselves. As the women in the communities became closer, they would draw in their husbands, and family friendships were forged. Now, with so many single moms, and two parent working families, it seems that there is no time for developing friendships. It is extremely difficult to balance jobs, time with our spouses and children, homemaking, and all of the transportation and errands that are needed. What suffers? Usually time for ourselves and time to actually have relationships with our families in Christ. Sometimes it seems as though our Church Community, which should be an inviting place of acceptance, love and fellowship, turns into once or twice a week worship, and maybe some more “events” to add to our schedules. It is a vicious circle. There has been a gentle tug of the Holy Spirit for me to start a Women’s Tea and Fellowship group at Church. I outlined a plan, and presented it to our Pastor, and then to a few women who are very active in our Church. For some reason, nothing ever came of it. My idea to bring women together to form relationships and community remained in my heart. I believe those relationships are the foundation that will ripple out, not only to our Catholic Church Community, but eventually into the surrounding communities. Isn’t it funny how the Holy Spirit works and tugs at your heart until you finally see the light? For me, it was the realization that I did not need to have a formal “ministry” in the Church to carry out the true ministry. I can keep my eyes, ears and heart open to opportunities to be a blessing to the women and groups I encounter. Either at Church, or anywhere at all! A few months back, I was volunteering at the library, and talking with Sheila, who is the “Director of the Library”. Not really sure of her true title, however, she is the one to talk to about any question regarding the library or the volunteers that help to run it. I asked if I could host an Appreciation and Fellowship Tea for the volunteers. Sheila’s face lit up, and she said that would be a wonderful idea. My heart warmed up thinking about the tea and thinking of ways to pamper the ladies! After lots of planning, baking, and decorating, the tea finally came to fruition this last Saturday. It was a beautiful experience to meet and get to know some of the wonderful women from our parish. 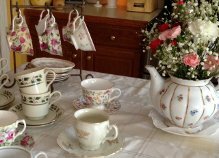 We enjoyed each other’s company, and they were pampered with relaxing music, flowers, cookies, and tea sandwiches, which were served with china plates and tea cups. Somehow it just feels different to drink your tea and eat your cookies from vintage china. Before we knew it, we were having a great time, sharing stories, and laughing. I look forward to getting to know them better in the future. Another tea in the Spring is already on my agenda! Now, my heart is open and I am listening for the Holy Spirit…to lead me to the Church Ministries, or particular women who could use a “Fellowship Tea”. My plan is to offer friendship, heart to heart, and in doing that, sharing Christ’s love. Through God’s grace and blessings, His perfect love will radiate out to many hearts in need. We all have specific callings, gifts and talents. It’s our daily lives and the “little things” that touch the most hearts. Any suggestions of ways for us to share with others in the Community of Christ? Please share any ideas you may have. Categories: Catholicism, Christianity, God's Whispers, Relationship, Somebody Loves Me | Tags: community, fellowship, friendship, gifts, god, Holy Spirit, talents, Tea | Permalink.